After the previous exceptional day, hikers face a lighter day, in which even the tough climb to top of San Roque,-where the emblematic figure of a pilgrim fighting against the wind is situated-, and above all O Poio, the Galician celling of the itinerary reaching 1335 meters in height, are fully compensated by the subsequent descent to Triacastela, of great beauty and one of the most cited by the community of pilgrims of Vivecamino.com. Throughout the whole day hikers alternate between beautiful panoramic views of the sierra of Os Ancares and O Courel and, on the descent the great mountain of Oribio along a zigzag path, through beautiful places, rural surprises and an admirirable a chestnut scenery. In general, the route avoids the asphalt, although in many sections it runs parallel to it, allowing those who falter or who prefer to avoid the ice and snow to continue by road. The pilgrims will not have problems in finding provisions, since several rural enclaves and inns are dotted along the route. The Jacobean itinerary divides in this journey from the earthy, uneven slope and gentle slope that crosses O Cebreiro (155.5 kilometres to Santiago) and leads the walker to the door of public shelter, where the pavement changes to concrete. After passing a council building, the path joins a solid a dirt road, with some loose gravel, and climbs the mountain Pozo de Area from almost 100 meters to reach 1332 meters in altitude. From the summit, and towards the north, it is possible to admire the rich forest and chromatic landscape of the Navia valley and the peaks of Ancares, and towards the south, the sierra of O Courel. The trail then descends, to follow a forest track, next to a power lines, until Liñares. Those who have suffered enough after the ascent to O Cebreiro, or in bad, icy winter days, a good alternative is to continue for three kilometres from the centre of town along and the LU-633 to Liñares. This road is taken to the right from the deviation immediately before the short climb that leads to public shelter. In San Etevo Liñares (18.7 kilometres to Triacastela) a location referred by the Codex Calixtino as Linar de Rege (Linar of Kings), whose name comes from the ancient flax plantations in the area, here hikers will find some services, such as a fountain, a shop or a bar. In addition, those who prefer to avoid crowds of O Cebreiro will find the rural tourism establishment Jaime, with four bedrooms. Once in the centre, the sign posted route is taken, that climbs between the houses to the pre-romanic church dedicated to San Esteban (VIII century), of similar workmanship as Santa Maria of O Cebreiro. With a single rectangular nave and a square tower, inside a Baroque altarpiece stands out. Subsequently, and after crossing the LU-633, the route continues along a stone path indicated to the left and begins to climb over Os Ancares. 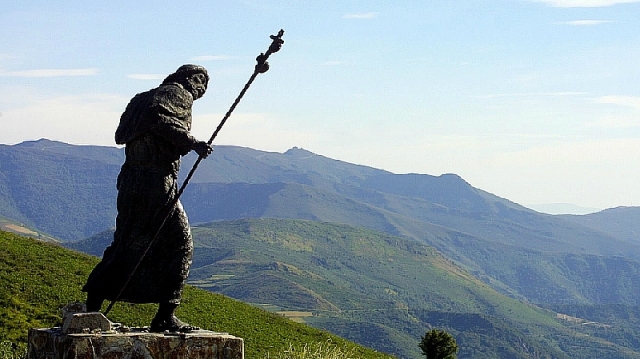 Uphill and down hill slopes, progressing through birch trees, a little further ahead the pilgrims reach the first stop of the day, San Roque, situated at 1,270 meters in altitude and crowned with an immortalized bronze statue of a pilgrim fighting against the wind created by the sculptor José María Acuña in 1993 to pay homage to all walkers who have overcome this hike. The figure is of a pilgrim on route, leaning on his staff and holding, in his left hand, his hat, a graphic example of the difficulties pilgrims have already faced and those that still remain to confront. After this slope, the voyage continues, advancing parallel to the LU-633 and after descending to 1,205 meters on slopes ranging from 7 to 17%, the asphalt road is accessed, the next centre, Hospital da Condesa (16 kilometres to Triacastela). The name of the enclave, which houses a public shelter, alludes its past Jacobean. In fact, this place hosted the most famous pilgrim hospital in the area. Built next to the sanctuary of Santa María a Real, which gave shelter to exhausted walkers reaching Galicia. Research suggests it was founded by the Countess Egilo, wife of Count Gatón, in the ninth century. In the centre, next to the hostel, the pilgrims will also find the mesón O Tear, where they can have breakfast from 6:00 am and take advantage of its pilgrim menu. This establishment, which retains an old loom in the dining room, also offers two rooms. The monumental centre retains the church of the hospital, built in honour of San Juan, which, like others in the area, has an austere Romanesque style with masonry walls and a tower, accessed by an external staircase. The route advances on a stone path and at the exit of the enclave resumes its path at the side of the LU-633. Continuing until a detour, which is taken to the right. At peak pilgrim times there may be a scarcity of beds, an alternative for those who want to rest at this point is to continue the journey to Sabugos, where the rural tourism establishment Casa de Rodríguez is situated. The Camino does not pass directly through this enclave. It deviates before hand, at a junction to the left and guides the walkers along a solid dirt track to the junction with the road to Padornelo (13.9 kilometres to Triacastela), complicated due to the steep slopes. This mountain hamlet, built on paving with an abundance of stone and slate slabs, this enclave also has a strong Jacobean tradition. It was here that the Order of San Juan of Jerusalem was installed its mission was to serve and defend the pilgrims. The hamlet is home to the church of San Xoán, constructed in the XV century, built from masonry with a slab roof and a distinctive bell tower. Having visited this temple the hikers should take a breath and have drink from the fountain because the most difficult moment of the day has now arrived. Despite its short length, less than 300 meters, the slope to reach the peak of Poio (13 kilometress to Triacastela) is extremely steep and intense. 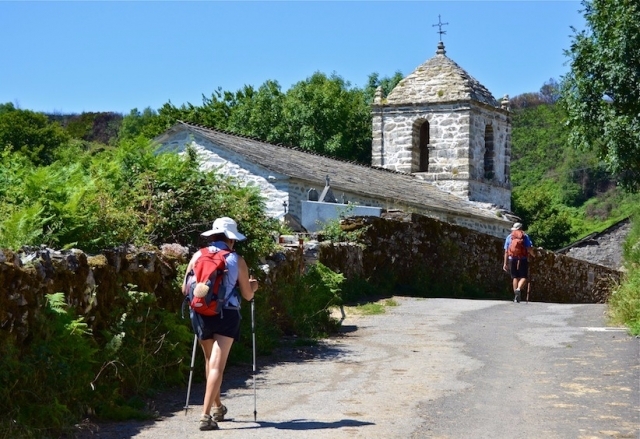 Having overcome this new difficulty, pilgrims reach the highest peak of the French Way in Galicia. With its 1,337 meters of altitude, from here they have superb views of the Sierra de O Rañadoiro and the valley below, behind previously climbed summit of San Roque. Here walkers will also find two strategically placed catering establishments with food and rooms, at which pilgrims can take a break to recuperate. Highly recommended is Santa Maria, with homemade food, generous portions and affordable prices. Devoid of frills and with a friendly service, refuling here will be a new experience on the Camino. The village of the "bidueiros"
Continuing the journey the descent begins, easy going throughout the early stages. The trail continues for more than 3 kilometers on a flat path parallel to the LU-633. From this path Fonfría is reached (9.8 kilometres to Triacastela), a village known for its fountain that flows at the edge of the camino and a hospital which has now disappeared. 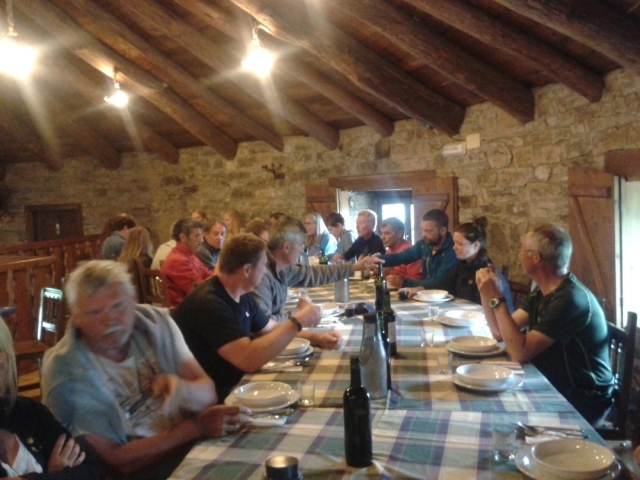 Ready to receive the pilgrims, who will find the complex A Reboleira, with a private hostel, restaurant and stables for equestrian pilgrims, Casa Rural Galego, an establishment with rooms and some bars with homemade menus, such as Casa de Lucas. 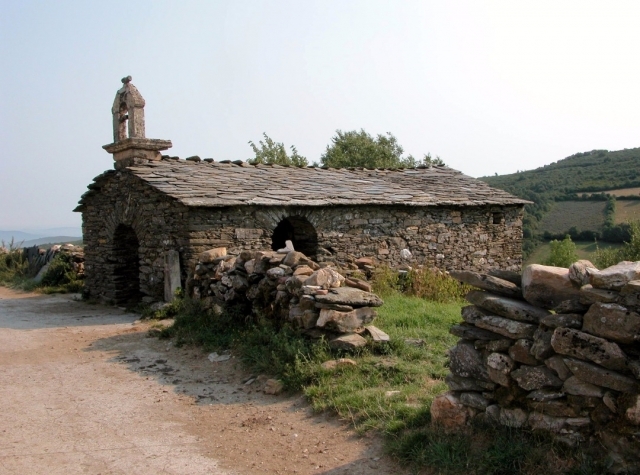 This place, in which hikers pass in front of an outside washing area, still used by some residents, there is also a church in honour of San Xoán. A monument with a rectangular nave, stone walls and a flagstone deck, inside it contains a collection of carvings. The descent continues from this point on a dirt path to rejoin the road at the point where it says goodbye to the mountains and the council of Pedrafita do Cebreiro and welcomes Triacastela, already visible in the distance. After this interval, the path continues on a new track that crosses the road. Bit by bit the path begins to climb. Having passed a number of crossroads and continuing straight on uneven ground, with many stones, and then on a concrete pavement which leads to O Biduedo (6.9 kilometres to Triacastela) the centre received its name from the large number of birch trees that greeted the pilgrims. Here walkers will find two rural houses (Casa Xalod Casa an Quiroga, with its restaurant-grill Betularia) and a picnic area with six tables where they can eat outdoors. At the adjoining small chapel of San Pedro pilgrims can have their credential stamped. At the exit of the enclave a new slope on earthy ground begins. Pilgrims enter the Caldeirón mountain, from where they can appreciate beautiful views of the surrounding mountains. The appearance of a quarry in the distance evokes one of the most memorable images of these Jacobean lands. Triacastela is located in one the few calcium and lime sources in Galicia and where at medieval times pilgrims gathered the stones that helped to build the Cathedral of Santiago and other Jacobean monuments. In the same way as walkers, cyclists need a simple stage after the difficulty of the previous day. On this day only the difficult climb to Poio test their ability. In adverse weather the recommendation is to depart from O Cebreiro on the LU-633, this asphalt road crosses the ancient route on a number of occasions. Cyclists should take extra precautions on the descent because some areas are very rocky, in particular the section from the summit, which passes through successive small enclaves. The path, however, provides magnificent view to be enjoyed from the handlebars. Como en toda cena peregrina, Babel de idiomas (alemán, inglés, coreano, ruso, francés, castellano). Hermosa experiencia... y con queimada al final!!! 3 reviews Distance to Santiago: 156 km. 2 reviews Distance to Santiago: 134 km. 1 reviews Distance to Santiago: 150 km. 1 reviews Distance to Santiago: 147 km. 1 reviews Distance to Santiago: 144 km.